The lipo laser ArtPro 14 is distinguished by it’s technology for non-invasive reshaping of the body and lowering of fats. The lipo laser will noticeably decrease the circumferance of the treated body part in just a few 20-30 minute treatments. The lipo laser technology was developed for the purpose of decreasing fat tissue. The lipolaser technology also known as Low Level Laser Therapy (LLLT) works directly on the fat cells and causes them to decrease. This can be achieved without any surgical procedures, pain or unwanted side effects. The lipo laser works in synergy with the body and works with the help of natural human mechanisms. How does the LipoLaser ArtPro 14 work? The foto-chemical effect that we achieve with up to 130mW of energy, and special laser diodes, whose wavelenght varies between 635 nm and 980 nm causes the pores in the cellular membranes to open. Through these pores saved triglicerid’s degrade into glicerol and fat acids. These substances are excluded out of the body with lymphatic drainage, with which we stimulate the faster working of the lymphatic knots and passages. After the treatment, physical activity is recommended, which even additionally encourage the flow of water in the body. It is important to know, that the device does not affect any other parts (i.e. the skin, veins and the nerves). What can be expected from the LipoLaser ArtPro 14 device? You can always expect excellent results after a 20-30 minute treatment. The customer lays down on the bed in a comfortable position after which a qualified person places the laser diodes (pads) onto the suitable body parts. When the pads are placed, the power and work time for each individual body part (pad) can be set. After everything is set you can let the customer rest in peace while he or she listens to music or watches the TV. Imidiately after a finished treatment we recommend a lymphatic drainage treatment and/or 10-15 minutes of physical activities on a vibrating plate. Regular recreation and water drinking is also recommended, but that is not the key to success. When following a regular protocol, we advise that people attend three 20 – 30 minute treatments per week. A viewing and test of the device is possible in our premises in either Novo mesto or Trebnje. Only after an thorough agreement can the viewing / test of the Lipo Laser ArtPRO 14 be performed elsewhere. 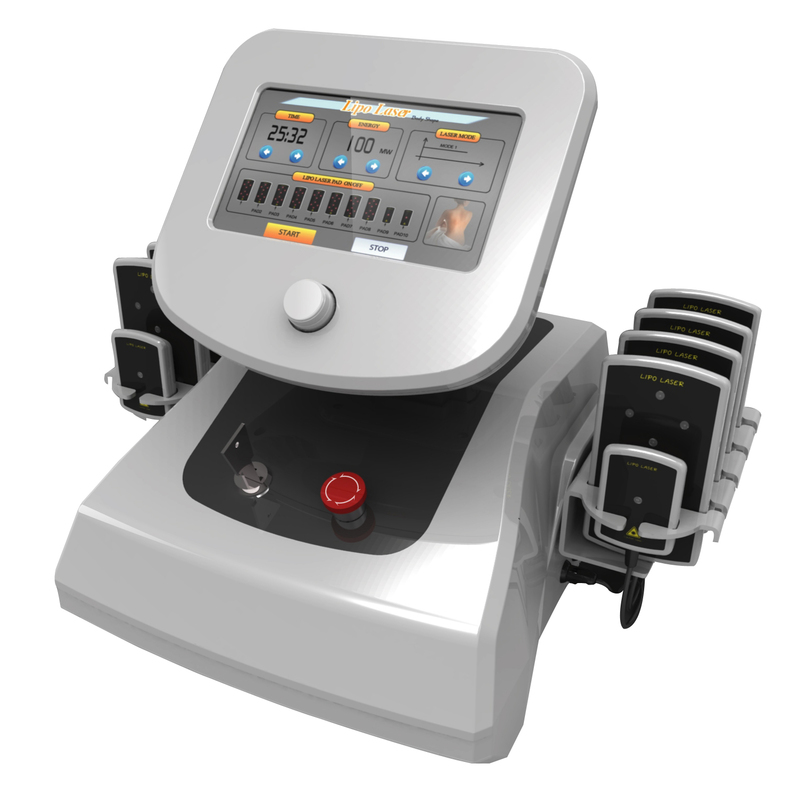 A low energy lipo laser that is being used more and more in treatments with a wide spectrum of indications, as it betters the healing of wounds, lessens swelling and relieves pain. This study has researched whether or not low energy lasers with a wavelength of 635 nm affects tissue fat and the procedural implementation of techniques of lipoplasty/liposuction. The experiment researched the effect of a diode laser with the wavelength of 635 nm and the power of 10 mW, with the use of of an optic for exclusive spreading of energy. The energy of 1,2 J/cm², 2,4 J/cm² and 3,6 J/m² worked on the fat tissue, that was taken from the lipectomy samples of 12 healthy women. The tissue samples were exposed to radiation for 0, 2, 4 and 6 minutes while using a tumescent solution and without it. They were examined with protocols of transmission and scanning electronic microscopy. For comparison they compared them to unradiated tissue samples. There over 180 picture taken and professionally evaluated. All of the microscopic results show that without being exposed to a laser, normal fat tissue look like a bunch of nodes in the shape of grape berries. After 4 minutes of laser radiation about 80 percent of fat was released from the fat cells, meanwhile 6 minutes of exposure to a laser the percentage had risen to 99 percent. The released fat was collecting in the intercellular space. The pictures of the fat tissue, that were made with a transmission electronic microscope at x60.000 resolution show a limited occurrence of pores and drastically lowered fat cells. The low energy laser caused a limited time pore to form in the cellular membrane, which allowed the fat to release from the cell. The cells in the intercellular space and the capillaries remained unchanged. Therapy with the low energy laser considerably affects on the procedural implementation of liposuction techniques. Since the start of the year 1921, when Charles Dujarrier tried to remove underskin fat from the calf of a dancer with the help of a uterine curette, the science of lipoplasty had improved significantly. Despite Dujarrier’s results being less admisable, he had shown a wish for bettering the beauty of the human body. Lipoplasty and it’s original tools were polished with the inovative orientation of experts such as Babcock, who in the year of 1939 began to carry out the technique of shaping the breasts and body. Babcock was followed by Pitanguy (1967), Regnault and Daniel (1975), Jackson and Downie (1978), Juri with coworkers (1979) and Illouz in the year of 1980. Every single one of them have contributed to the growing popularity of beauty operations. The process experienced a revolution in the year 1980, when Schrudde introduced liposuction as a way of localy removing fat. Fournier and Oteni used cannule with a non cut off edge to perform body reshaping using lipolysis. In the year 1986, Fodor described a super moist technique. Meanwhile at the same time, Klein introduces the tumescent technique, which achieved a lyposuction with only a local anesthesia and nearly no blood loss. This hugely raised the popularity of lipoplasty. In the year of 1992 Zocchi developed an internal ultrasound technique, while later in 1998, Silber develops an outer ultrasound technique. Neira and coworkers introduced a new liposuction technique, which enabled the lliquefaction of fat, with the help of a low energy laser. All of the techniques helped improve the surgical procedure: some of them decreased the risk for the clinet, others sped up the process, but all of them strive to decrease the fat parts, so they secrete more easily. The combining of a low energy laser with established ways of performing lipoplasty with the intent of designing a new technique is a result of the dynamic use of knowledge. Low energy lasers are commonly used for physical treatments. These devices are known to not cause or provoke infections. With these sorts of laser treatments the used dose of radiation does not cause a direct percieved rise in temperature of the tissue and macroscopically seen changes to the structure of the tissue. In the last decade low energy lasers are asserting themselves more and more in a wide variety of treatments, for they improve the healing of scars, lower swells and relief pain. The energy of the laser beam that works on the tissue is defined as a dose. The unit for it is a Joule [J] per square centimeter [cm²]. A dose is calculated by multiplying the laser power (in milli watts [mW]) with the treatment time (in seconds [s]) and divide it with the surface of the tissue, that is recieving the laser radiation. Many studies were performed, which wanted to revel how to most effectively use the laser energy to process fat tissue. The results are dependent on the following factors: coherency of light, wavelength and laser power. Liposuction techniques and the accompanying tools have been used for plenty of years. Despite all of this, with every newly researched method or process, new expectations about the potencial benefits of the method for humanity appear. The scientific proof in this atricle tell us about how the technique of laser lipoplasty means a valuable contribution for the area of beauty operations and will create the same expectations as older techniques. Some of it’s advantages include the decreased risk for clients and the better quality of their life. Random samples taken from 12 clients were reviewed under a scanning and transmission electronic microscope. The results revealed that the use of the tumescent technique is an important add-on to laser processing, as it enables better penetration of the ray, and with it, better excretion of fat. In the continuation of this post the results of the study are discussed. The results of both protocols of the microscopy show that a 6 minute exposure to laser radiaton under laser lipoplasty without the use of the tumescent technique is comparable to a 4 minute laser exposure under laser lipoplasty with the use of tumescent technique. Therefore the latter reinforces the efficiency of laser radiation onto the cells. They also noticed limited time pores, through which the fat ran into the intercellular space. In the samples which weren’t exposed to laser radiation, but were processed with the tumescent technique, the three dimensional scan with the scanning electronic microscope showed that the fat cells kept their original shape. In the intercellular space you could spot more collagen fibers. The 4 minute laser radiation without the use of the tumescent technique the liquifaction of fat only occured in a few fat cells. At the 6 minute laser radiation without the use of the tumescent technique the microscope showed a higher number of fat cells with liquified fat, but not all of the cells were in this state. When the traditional tumescent technique was combined with the 4 minute laser exposure, there was a partial decomposition of the fat cell membrane that could be seen. About 80% of the fat was excluded from the cell. With the increase of the laser radiation to 6 minutes, a full decomposition of the fat cell membranes, which were now empty and weirdly shaped was achieved. The samples which were processed with the traditional tumescent technique, that were not laser radiated, were shown by the microscope to be completely soaked with homogeneous fat. The cells had the correct diameter, they were close to one another, the space between them was decreased. When 4 minute laser radiation was used with laser lipoplasty, the transmission electronic microscope showed a partial loss of cell fat and an enlarged intercellular space. There were also visible deformed fat cells, which lost their circular shape. After a 4 and 6 minute exposure to the laser the capillaries remained completely unchanged. When the laser lipoplasty was performed with a 6 minute radiation, the transmission electronic microscopy revealed a perfect loss of the usual shape of the fat cells. The fat had completely left the cells. More than that the cells were deformed and hadn’t kept their original shape. Even their membrane was deformed, decomposed and wrinkled. It’s a case of a polar solution that destabilizes the membrane of fat cells and with that eases the penetration of laser light. This was found on the samples by both protocols of microscopy. When the laser is working, the water that is contained in the cells. Due to the effects of these two mechanisms the low energy laser is an incredibly effective tool to carry out liposuction treatments with. The membrane of the fat cell is activated with different concentrated cyclical adenzoin monophosphates, which stimulate the citoplasmatic lipasis and triggers the change of triglicerids into fat acids and glicerol, which easily go through the cellular membrane. The adrenaline, that is also present in the tumescent solution stimulates adenil cyclase, which together with the effect of the laser radiation on the inner and outter mediums of the fat cells, changes it’s molecular polarisation. This process can be additionally accelarated because of the leakage of fat acids and glicerol into the intercellular space and their removal. Recently, a study was published, which confirms the effectiveness of low power laser light and it’s power to trigger change in biological tissues. The study also confirmed the impact of a laser on cells, even in small doses. Findings show that light generates repeated changes in the transmission spectre of the human venose blood, if it is generated by by a low intensity radiation of the laser, which releases a visible light mixture of helium and neon. This means that laser light causes changes, which shows a huge potential for spectrometrical studies. Studies were also conducted on the effect of low energy laser radiation on the degranulation of gut mastocites of rats. The study showed that laser radiation (in this case the wavelenght was 890 nm) stimulates the degranulation of gut mastocites. Aside from that the results showed that the effect was dependent on the dose, due to the fact that the highest ammount of degranulation was reached after being exposed to laser radiaton for 15 to 30 seconds, with the power of 25 mW. It is also worth mentioning that the source of the laser radiation was a confocal microscope, with which the effects of the low energy laser on the cellular components and functions on the level of one cell were being monitored at the same time. The culture of human embryonic fibroblasts were prepared for in vivo microscopic evaluation. The cells were stimulated with the laser from the confocal microscope, which let out a mixture of argon and kripton light with a wavelength 647 nm and energy of 0,1 mW/cm². The laser radiation caused a higher basicity of the liquid part of the citoplasm and raised the potencial of the mitochondrian membrane. The studies also noticed temporary reactions of the calcium in the citoplasm. The effect was limited to the radiated microscopic fields. During the experiment no toxic effects were detected.